Harry Potter and the Deathly Hallows: Part 1 (2010) – Movie Review – Another Movie Blog! Throughout this series of reviews I have talked about how the success of Harry Potter changed the landscape of the movie blockbuster. Now we come to maybe the most controversial influence this series had on the franchising world: the splitting of a single source into multiple films. With the sheer length of Deathly Hallows and how much happens in that book, it made sense some form of sense. I just wish splitting this into two movies didn’t encourage everyone else to do the same. The vast majority do not work. The Hobbit movies are ruined with pointless filler, and The Divergent movies have to continue existing. Even when it makes some semblance of sense, like with Mockingjay and even the terrible Twilight: Breaking Dawn movies (those last two are pretty nuts in their own unique ways), each are weakened by separation and serve only to show the flaws of each source material’s plotting. And as much as I like both parts of Harry Potter and the Deathly Hallows I must concede that each movie is not as effective without seeing the two back to back. At the very least they are not to be seen separately. Like the epics of Classic Hollywood, which had intermissions, it would have served the movie well to be of a single, grand piece. It doesn’t look like a trend that will stop very soon, and a big part of me thinks it’s a practice we need to stop encouraging. Now watch how I immediate go against that by telling you that, after Prisoner of Azkaban, this is my favourite Harry Potter movie. Given the “Harry On Camping” jokes I have heard this might be a controversial opinion, but as with Mockingjay, the split has an interesting effect on the two films. The first films are full of lots of character development and exploration, but little in the way of a climax. The second films have lots of climax, but little in the way of exploration. And given the choice, I am more likely to choose the former than the latter. There is an air of melancholy that runs over the entire proceedings of Deathly Hallows Pt.1. Much of that is down to the production and locations, which are as simultaneously magical and dark as anything in the movie’s story. From the Ministry of Magic – two parts Brazil and one part Leni Riefenstahl – to the hilltops that look like the locations of other planets, the word feels as apocalyptic and uninviting as the lead characters feel being thrust into the tyrannical world. Other entries in the series might be dark, but this feels like the death of childhood. At the same time, the reoccurrence of threes – items given to leads, the three brothers and the three Deathly Hallows – has more of the fairytale to it than any entry in the series. And the best fairytales are always the dark ones. The pacing of the movie allows scenes to breathe in a way that the latter half of the series isn’t able to do, as they all reach to hit every significant beat of the plot. JK Rowling’s strengths were always in world-building and character interactions rather than tight plotting, and it is in this one in particular that is allowed to shine. The animated sequence of silhouettes that details the story of the Deathly Hallows was a particular genius stroke that might be my favourite scene from the entire series. But beyond that is a showcase for the three main leads, the one’s we have grown to care about. Scenes like Ron destroying the horcrux, or Harry standing over the graves of his parents, are of course obviously strong moments. But it’s things Hermoine and Harry dancing, a movie invention, one that in a more rushed production would be left on the cutting room floor, that become the most poignant moments. It is finding the happiness in each other amidst the darkness of the world. It’s like what the more annoying moments of Half Blood Prince was trying to do, but done more successfully. And the previously annoying love-triangle drama is made less so when it is also counteracted with the power that the horcruxes have on their psyches. After having seen these actors grow up over nine years, it is here that Daniel Radcliffe, Rupert Grint and Emma Watson really go through the gamut of emotions, that all of them show just how amazing those casting decisions were six films ago. Still, this is a David Yates directed Harry Potter movie, so there still has to be decisions that take me out of the piece. For one thing, the shakey cam sections feel really jammed in, and with the forest chase scenes reach a point of absolute nauseation, overcompensating for the lack of action. In a script perspective, although I appreciate the expansion of elements, there are points when Ron is missing from the group that it begins to feel its length, and the trope of “break up but we know they gonna get back together” plays out in the slightly annoying way you’d expect (though here it’s mostly platonic!). 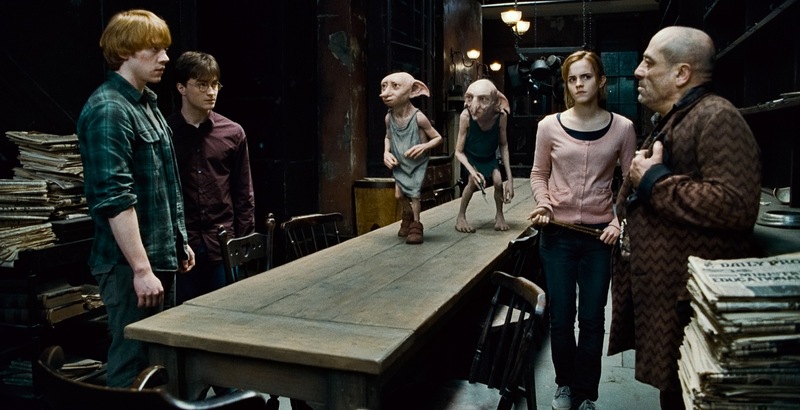 And whilst the death of Dobby seems a natural place to end the movie – and given how much he annoyed me in the Chamber of Secrets it’s pretty shocking how much I was affected in those moments – it also isn’t a death with the story weight of a Sirius Black or a Dumbledore. In that respect it can’t help but feel like an incomplete piece, and it’s here where when watching the second actually enriches the experience.